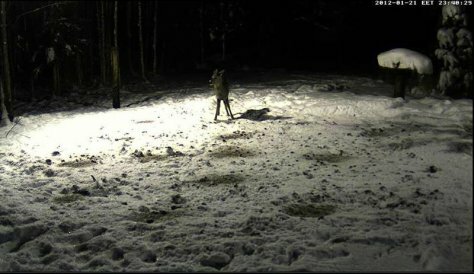 During a couple of evenings a lonely little roe buck has visited the feeding ground - cautiously, more looking it over. The snow cover this winter is soft and the snow is fresh. It is still easy for roe deer to find food: shoots from deciduous trees and the shrub layer – bilberry, cowberry, heather. As the winter weather becomes more severe they will be interested in the feed racks and hay and bundles of leafy twigs brought to the forest. There are complaints about the lack of deer herds but locally they are still there. Two herds in Raplamaa are quite close to each other – one with nineteen, the other with twelve animals. Hunters have refrained from hunting deer the last few winters and so the deer flocks forage quite near settlements which makes them feel a little more secure with respect to the predators – wolves and lynx – that have become more numerous. Severe winters and predators don’t leave weak animals, and so a new deer population will develop in our forests – strong does often have two kids; whether it will work out this well we will see towards spring and early summer.